Grinnell Glacier is the most frequently visited glacier in Glacier National Park with an incredible trail along the way. 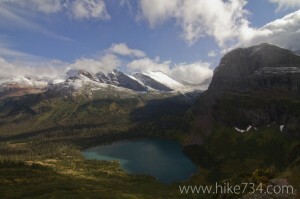 The first two level miles are spent briefly along Swiftcurrent Lake and Lake Josephine’s north shores. Once at the end of the lakes, the elevation begins. From here on out, the views keep getting better as you climb with increased chances of seeing the area’s big game. As you gain a bird’s eye view of Grinnell Lake with the tall cliffs of Angel Wing towering above, you get to see the lake’s incredible emerald color, which is caused by suspended “glacial flour” – rocks ground into a fine powder by glaciers. Just below the glacier, there is a sitting area and a pit toilet. 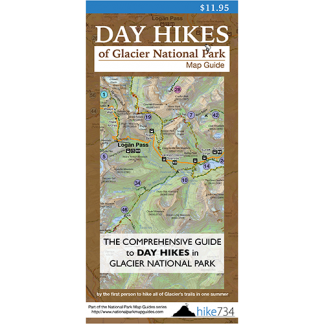 In 0.34 miles, you will arrive at Upper Grinnell Lake with Grinnell Glacier to your left while Salamander Glacier clings to the cliffs of the Garden Wall in front of you. The Continental Divide runs along the top of this wall and, on the other side, motorists drive up Going-to-the-Sun Road.